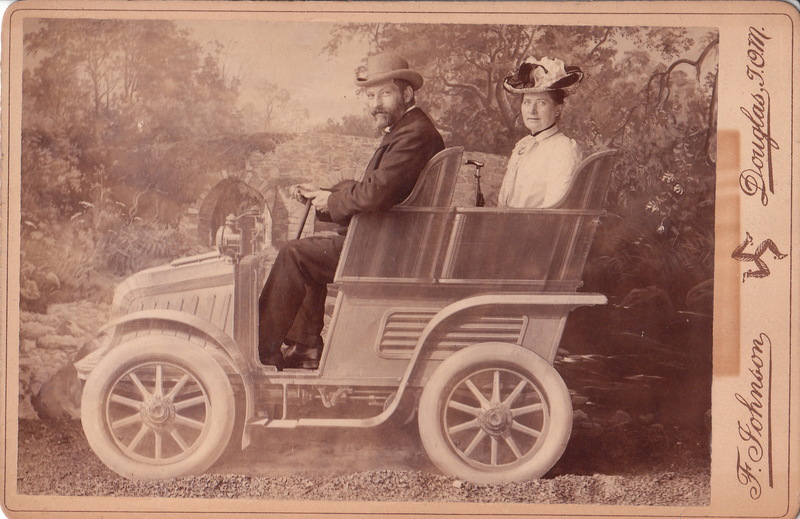 A man and a woman, presumably, a married couple, pose for their portrait in a car that is going nowhere. This automobile is simply a photographer’s prop. The advantage of a married couple being in a car that is going nowhere, is that the man can’t get lost, and then deny it; and the woman can’t keep telling him to stop and ask for directions. The pictured car is located in the photographic studio of Frederick Johnson. Johnson’s studio was in the town of Douglas, on the Isle of Man. He actually operated two studios there; the Fort William Studio, and the Express Bridge and Battery Studio. The Isle of Man is a self-governing British Crown Dependency located in the Irish Sea, between Great Britain and Ireland. At the time of this photograph, the Isle of Man was a major tourist attraction, and according to many accounts, tourists flocked to photographers during their vacations there. Not much information could be found about the photographer of this image. It is known however, that he operated a studio on the Isle of Man during 1881 through 1894. He may have also been there before, or after, the aforementioned years. As an aside, it is interesting to note that during the early days of automobiles in America, some photography studios were built that were designed to allow patrons to drive their cars into the studio, and pose alone, or with their passengers, for portraits of them sitting in their cars. This practice was truly a reflection of the history of Americans love affair with their automobiles.